Friedrich von Germann sketched this British soldier dressed for the Canadian winter in 1778. As depicted in von Germann’s drawing, British soldiers donned blanket coats, wool leggings, and fur-trimmed “Canadian caps” to keep warm in wintertime. When the men of the 8th Regiment arrived at Michilimackinac in 1774, they, like the rest of the British army posted in Canada, found themselves in a remote wilderness with pleasant, temperate summers and harsh, bitter winters. The Canadian winter climate was significantly cooler than what most soldiers were accustomed to in Britain. Fortunately, several uniform pieces allowed these men to live and even fight in the coldest of Canadian winters. With the lapels buttoned over, collar turned up, and tails let down, a soldier’s regimental coat helped protect him from the cold. Blue wool leggings further protected his legs. Snowshoes: What a great idea! But, where did the original idea for snowshoes come from? As the new year begins and winter locks the Straits of Mackinac in its icy grip, today we look to a few historic views of winter on Mackinac Island. Click the images for an expanded version. These soldiers from Fort Mackinac are bundled in Army-issued cold weather gear as they shovel a path down Fort Street sometime around 1890. Each man received a heavy wool overcoat as well as rubber boots, a fur hat, and mittens. Many of these men are wearing their winter hats, made from muskrat fur. 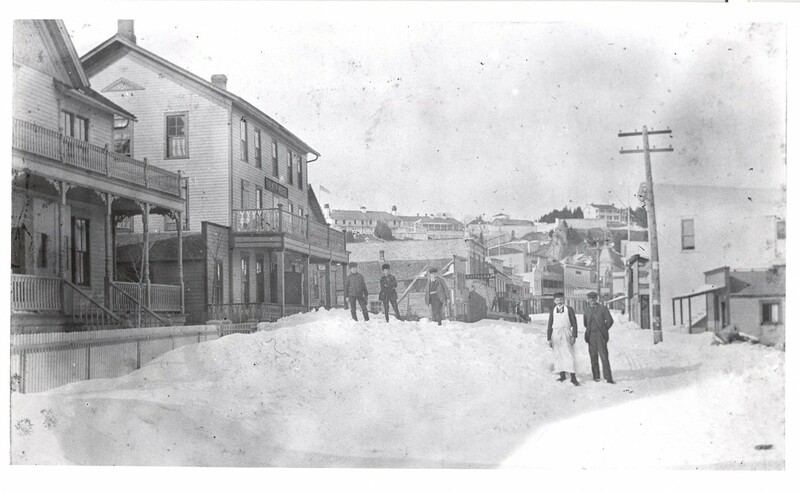 Main Street in downtown Mackinac Island is filled with snow in this view taken around 1900. 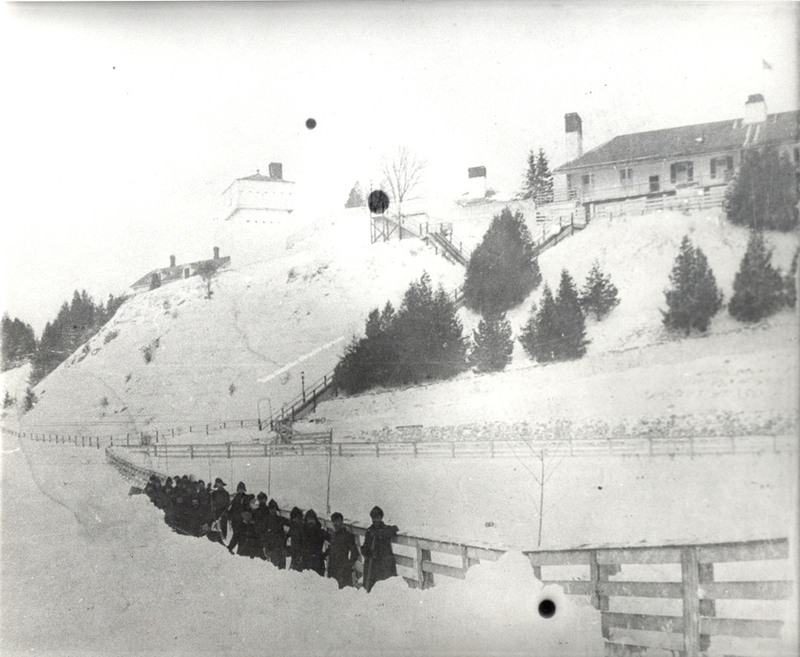 Just like today, fewer people visited the island in winter, so the McNally Cottage boarding house (seen at far left) and Palmer House Hotel likely had few visitors when these boys played on the snow banks out front. Despite the snow, island residents may still have enjoyed parties at the town dance hall, visible just to the right of the Palmer House. Originally built as a roller skating rink, the dance hall became a motion picture theater by 1907. Today the building remains downtown, transformed into the Haunted Theater.